Doctor Who: Revisiting THE EDGE OF DESTRUCTION | Warped Factor - Words in the Key of Geek. Dr. Moo breaks the fast return switch. The Ede of Destruction is an unusual entry to the Doctor Who canon. It’s been more than fifty years since it aired and the show hasn’t tried anything like it since then. This is both the story’s biggest flaw and greatest strength. The entire plot – clocking in at 47 minutes – is set exclusively, save the final scene, inside of the TARDIS with only the four leads making an appearance. 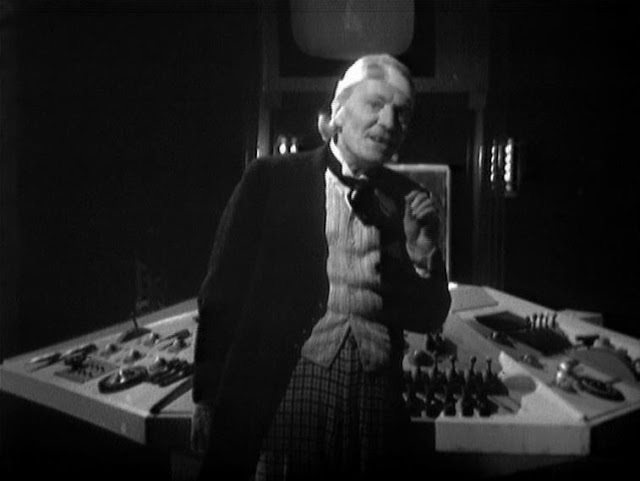 William Hartnell’s Doctor is still gruff and angry, quick to accuse Ian and/or Barbara of wrongdoing at the first sign of trouble and even at one point threatens to throw them out of it whilst in flight; essentially this would be murder. By the serial’s end however we can see him growing, and he wastes no time in giving Barbara an apology for his actions once things are resolved. The story begins with the TARDIS suddenly lurching and throwing everyone to the floor where they all fall unconscious, with the Doctor even sustaining a head injury. Barbara comes to first and initially acts towards Ian as though the pair are still at Coal Hill School. Ian spends most of the story dazed while Susan is loud and screaming and at one point tries to attack Ian with a pair of scissors. Carole Ann Ford overdoes it in her performance here and this becomes very grating as the story progresses, but it adds to the tension and the unnerving atmosphere, plus everyone else (especially Jacqueline Hill) is so good that they make up for it. 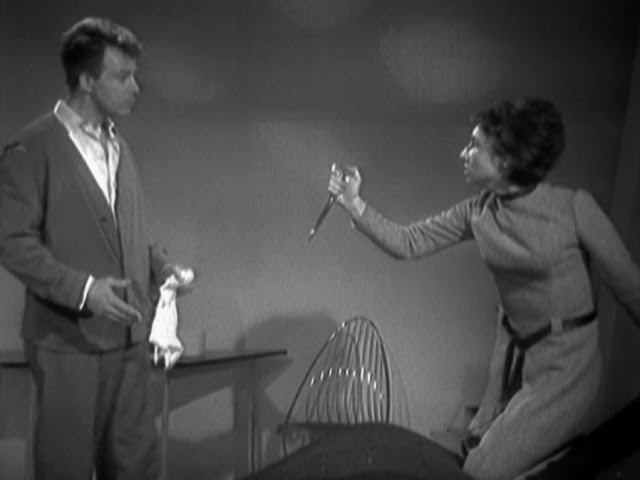 It’s she who suggests that something has come into the ship and has inspired the Doctor to start threatening to kill Ian and Barbara for suspected sabotage. It’s not just the cast who are acting out of character but also the TARDIS herself. This is, in fact, the first time that the time machine has shown any hint of sentience – stories like The Doctor’s Wife or Journey To The Centre Of The TARDIS would later run with this concept – with the TARDIS doing things to indicate that something’s wrong. Doors open and close for no reason, lights flash, non-existent images appear on the monitor, a clock melts and the console gives anyone who approaches it an electric shock. Yet despite all this there’s no indication on any of the in-built machines that anything’s out of the usual. This is the scenario that leads to the Doctor making threats, Barbara shiftily looking round as though she may try to hit someone and Ian even attempting to throttle the Doctor in the cliffhanger. When the Doctor once again accuses his two kidnappees Barbara finally snaps and gives him a piece of her mind. When she shouts at him, like the wronged schoolteacher she is, it’s totally deserved. The underlying tensions between him and the two teachers had been building up for 13 episodes at this point and now it finally comes to the fore. When she reminds the Doctor of all the times they’ve saved him and Susan from potentially fatal situations it’s an explosion that was always going to happen and it’s enough to put the Doctor in his place. If he’s going to have them live-in with him they’re going to need mutual trust, but not just these two. You could argue this is the same situation with every companion he takes on for the rest of the series to this day – the Doctor needs them just as much as they need him and this story is the one where he finally realises it. With that heard, the Doctor finally decides to stop hurling threats and investigate the problem. It turns out to be a broken spring inside of the fast return switch. 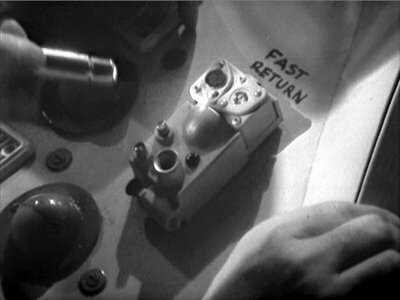 The Doctor had used this switch after leaving Skaro in order to return Ian and Barbara home but it broke and the ship kept hurtling towards the beginning of time, eventually it would have been destroyed by this. The TARDIS crashed itself in order to stop this happening and tried to warn the crew about it – hence the weird stuff that was going on. Now I’m not too fond of this explanation because it means that the TARDIS apparently is now able to go right back to where and when it last was with ease. Part of the fun of the show is that the Doctor, more often than not, has no idea where the ship will land and if his ship has this switch then this is totally undermined. The fact that this plot device has not been seen since tells you everything you need to know. So how well does The Edge of Destruction hold up today? If I’m being honest, it’s not that great. However it does advance the relationship between Doctor & Companion and for the tense unpredictability of the whole thing it’s still well worth a watch if you haven’t seen it before or recently. While by no means an all-time classic, it’s still a compelling story that keeps you guessing all the way through.